Up to 10 KA DC, Up to 33kV, ONAN/OFWF cooling. A rectifier transformer circuit permits six-phase double-wye operation with 120.degree. conduction, (without the use of an inter phase transformer), and provides any predetermined degree of phase shift. 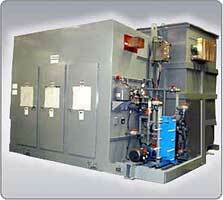 The transformer comprises of a zigzag wye primary winding and a six-phase star secondary winding. By choosing the proper ratio for the turns of the zig and zag portions of the primary winding, any degree of phase shift can be obtained. The rectifier transformer is ideally suited for multiple-phase installations wherein several rectifier transformers are used, each providing a different amount of phase shift, without the use of separate phase-shift transformers. Having achieved a good position in most of the product categories it is involved in, URJA increasingly looks to International business to power its growth volumes. Over the years, URJA’s Transformers have been exported to over many countries worldwide. URJA is exporter of power transformers and is aggressively pursuing export opportunities for all its product categories.